Glenn Paauw observes that the Bible is not only the best selling book of all time, it is also the best selling book every single year (13). There are Study Bibles with shiny new notes and cross references; there are patriotic Bibles, ‘wilderness’ Bible’s, and a host of other Bibles for every variety of our Chicken Soup souls. Yet despite the ubiquity of the Bible, there is not a ‘deep awareness of the themes, stories and truths of the Bible’ (ibid). We tend to read the Bible in increasingly atomistic ways—mining the text for timeless truths totally disconnected from biblical history, canon and context. Scripture Mcnuggets™. My core argument is that for most of us, most of the time, small readings prevail over big readings. “Small” and “big” refer to more than the length of the passage we take in. I define small readings as those diminished samplings of Scripture in which individuals take in fragmentary bits outside of the Bible’s literary, historical, and dramatic contexts. Also implicated here is a corresponding meager soteriology—that narrow, individualistic, and escapists view of salvation so common among Christians. (11). In contrast, big readings result when “communities engage natural segments of text, or whole books , taking full account of the Bible’s various contexts” resulting in an “apprehension of the story’s goal in a majestic regeneration that is as wide as God’s good creation”(12). Paauw aims at moving us beyond our highly individualized consumption of ‘Scripture Mcnuggets,’ and welcomes us to the feast of Scripture. The Iconic Bible (chapters 14-15) (p.19). Chapters one and two describe the ‘Elegant Bible.’ Paauw traces how Study Bibles and Chain Reference Bibles, and the like, suffer from biblio-clutter, distracting readers from the words of Scripture in favor of the commentary. Even chapter numbers and headings divide the text and distract us from engaging the world of Scripture. Paauw argues for an “extreme Bible makeover”—a Bible excised of distractions, highlighting the words and message of the text. Modern consumers are individuals first and foremost, centered on their ability to make choices as independent, self-determining entities. Since most people don’t buy what they don’t want to hear, this filter prevents our constant search for pleasant verses and favorite passages from ever introducing us to the real Bible. We too easily end up seeing a Cheshire-cat-Bible—all smiles and no body. We find encouragement, but no correction, we heap blessing on blessing and promise on promise but fail to be challenged. This fragmented Snacking Bible fails us, because we have prevented the Bible from being what it is, and turned the Bible into something it is not. How can the Bible possibly do its work? (61). Against fast-food- Bible-conumption, Paauw invites us to feast on the totality of Scripture. In chapters five and six, Paauw tackles how our dualistic search for ‘timeless truths’ obscures the ‘time-full’ historicized Bible which speaks to our past, present and future and God’s actions in the lives of His people. The centerpiece of the book is “The Storiented Bible” described in chapters seven to nine. Paauw urges us towards a historical and genre sensitive reading of scripture which has an eye on the Big Story, and our place in it. This involves a canonical sensitivity to the big picture, reading whole books of the Bible and a commitment to live in creative fidelity to Scripture’s grand narrative. Paauw revisits his earlier themes in the latter half of the book. The historicized Bible is “the Earthly Bible” immersed in the particularities of earthy life (chapters ten and eleven). The privatized “Snacking Bible” gives way to the communal engagement of the Synogogue Bible (chapters twelve and thirteen). The cluttered ugly and over-complicated TMI Bible, gives way to the elegant Iconic Bible (chapters fourteen and fifteen). Paauw makes a strong case for us to recover the particularlity of the Bible, the communal context of Bible reading, and to make the words of Scripture beautiful again. 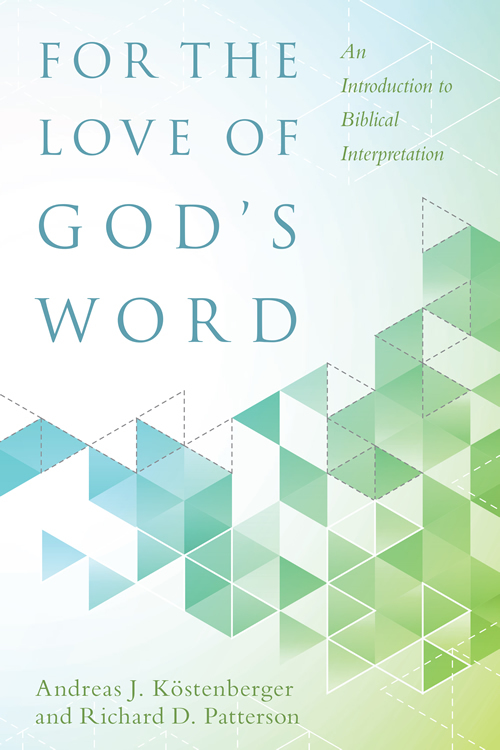 For the Love of God’s Word is an introduction to biblical hermeneutics. Andreas Köstenberger and Richard Patterson have teamed up again to help serious Bible students interpret scripture well (they previously authored Invitation to Biblical Interpretation, and this book is an abridgment of that text). Köstenberger and Patterson have a three part approach to interpreting scripture, what they call ‘the Hermeneutical Triad’: History, Literature and Theology. This is similar to the approach of my own professors of Hermeneutics and Exegesis and does real justice to the interpretive task. Köstenberger and Patterson are at their most brief in part I (, where they give a brief overview of Biblical history, discuss the contribution of archaeology to our understanding of Ancient Near East and Greco-Roman culture, and they give some interpretive suggestions for distinguishing which biblical customs remain normative and those which are ‘limited in application.’ They do all this in about twenty pages. Part II is far more substantive, occupying the largest chunk of the book . Köstenberger and Patterson discusses Literature, focusing on three units: canon, genre, and language. In discussing canon, they discuss the applicability of the Old Testament, the concept of covenant and the way the Old Testament testifies to Jesus as the long-awaited Messiah. They go on to discuss how the various parts of the New Testament augment and supplement each other. They then move on to discussing the distinctives of each genre in scripture: historical narrative, poetry and Wisdom, prophecy, the narratives of the Gospel and Acts, parables, epistles and Apocalyptic. Finally they look at language (discourse structure and the meanings of words). Part III examines theology. Köstenberger’s and Patterson’s focus is to make sure that our theology flows from the text (rather than our theology determining our reading of the text). The resources they suggest here are from the discipline of Biblical theology, rather than the theological tradition. Their final chapter puts together a hermenuetical approach to getting an application out of the text. This is a text book intended for an introductory course in hermeneutics. However, its readable and understandable for the working pastor or any lay Bible teacher. For example, their section on interpreting biblical genres can be a reference point for preachers planning to launch into unfamilar biblical terrain. Or at least a refresher. My criticism of the book would be constricted to what’s not here (i.e. an in-depth examination of narrative technique and poetic structure, discussion of how the wider theological tradition informs our understanding of the text, discussion of what the reader brings to the text, the role of the Spirit in interpretation, etc). However this is an introductory text and does a great job directing people on how to interpret the Bible in culturally and literary sensitive and canonically aware way. As a pastor I can readily see ways their approach is helpful to me. Those that follow Köstenberger’s and Patterson’s will read the Bible well. I give this five stars. Note: I received this book from Kregel Academic in exchange for my review. Interpretation of the Bible is called legion for they are many. There are many hermeneutical approaches and countless interpreters. Of course not all interpretations are equal, some fail to attend to important aspects of the hermeneutical process. In order to read the Bible responsibly, you need to pay attention to the original intent, the theological tradition, the church, contemporary issues, etc. Stanely Porter and Matthew Malcolm have edited together eight brief essays advocating for responsible interpretation of the Bible in an age of plurality. While the contributors share broad theological commitments, they each speak with their own voice, in their own discipline and bring their unique gifts to the hermeneutical task. In chapter one, Thistleton defines what he calls ‘responsible plurality’ by contrasting Mikhail Bakhtin’s concept of ‘polyphonic meaning’ with Jacques Lyotard’s pluraformity. The former approach acknowledges the diversity of genre, authorial intent, as well as interpretive approaches. Lyotard’s approach relativizes all meaning and therefore marginalizes the notion of responsible reading (22). Thistleton argues for a polyphonic concordance, and closes his essay with some suggestions of how the discipline of hermeneutics can fruitfully develop. Porter discusses the interface of biblical hermeneutics and theological responsibility (chapter 2). Porter contrasts biblical hermeneutics with biblical interpretation by positing that interpretation involves processes and techniques related to interpretive acts, whereas biblical hermeneutics is a broader study of how we read text (31-32). This means not just attending to the original, or authorial intent, but the whole hermeneutical process and what the Bible means in a contemporary context. Included in Porter’s essay is an implict critique on the recent theological interpretation movement, which proposes a method of reading the Bible (with deference to precritical sources) without paying sufficient attention to the history of theological reception. In chapter three Briggs argues for scriptural responsibility by using hermeneutical framework of ‘Scripture as’ to explore the ways that scripture functions. Briggs describes the Bible as a series of texts which explore theological themes dialogically (162). So he suggests that scriptural responsibility involves attending to the two-testament structure, fostering hermeneutic discussion between those with competing theological claims, and understanding scripture as a means of grace where God communicates himself through the various genres of the biblical material (64-9). In chapter four Malcolm discusses kerygmatic responsibility This is a fascinating essay reflecting on the proclamation and mission of the early church and the reader reception of the New Testament. Malcolm suggests that the reader most able to respond responsibly (and responsively) to the text is the one who is a ‘primed’ and ‘faithful’ intepreter. In the examples Malcolm gives, a primed reader (of Pauline Epistles) will ‘know that Paul’s kerygma focuses on the humiliating death of God’s Messiah’ (81), this will illuminate aspects of the Biblical text and make the reader aware of common themes emerging throughout the New Testament documents. Likewise the faithful reader is ‘a cruciform interpreter.’ Malcolm writes, “one who is shaped by the cross is particularly attuned and open to the formational orientation of the kerygma, whether explicit or subtle (82). Dunn argues for Historical responsibly (chapter 5). By this he means attention to the original context as the primary factor for understanding the meaning of the text (99). More than other authors in this volume, Dunn relativizes the contributions of church tradition to the hermeneutical task. Morgan urges critical responsibility (chapter 6) nad argues that we should make use of critical scholarship and approaches to help us get a better grasp on the biblical witness. Gregg argues for relational responsibility. He pays homage to the Reformation’s idea of sola scriptura and the normative authority of the Bible. However modern interpretation is constrained by the early councils and creeds which helped define theological orthodoxy. The creeds did not create orthodoxy ex nihilo but interpreted the Bible faithfully. Hence the Bible remains the supreme authority. Morbley’s essay rounds out the collection with some reflections on ecclesial responsibility. He observes that his own theological education taught him to question traditional notions like Pauline authorship of the pastoral epistles, but did not equip him to interpret texts for the church which affirms veracity of these epistles as part of the canon. Porter and Malcolm’s conclusion discusses the distinctive character of each of the above essays. Despite being a short book, this is not a light book. There are a number of ideas and important considerations discussed here for any one who wants to interpret scripture well. This book is probably too technical for readers who have not studied the topic of Biblical hermeneutics. Those who have will find these essays suggestive, provocative and challenging. As with all multi-author books particular chapters are more stimulating than others. I particularly enjoyed Thistleton’s chapter and his survey of contemporary developments. I also enjoyed reading several of these essays because I have books by these authors and it is helpful to be able to map their interpretive philosophies. I give this book four stars.